The Decades Blogathon (2016) is an online event hosted by Mark (not me – another one) at Three Rows Back and Tom at Digital Shortbread. Two great movie review sites that invite like minded cinephiles to write about any particular film of their choosing. The only provision: choose a picture from any decade with the year ending in ‘6’ (given that it’s now 2016). That’s it. Welcome to day three of the Decades Blogathon – 6 edition – hosted by myself and the one and only Tom from Digital Shortbread! The blogathon focuses on movies that were released in the sixth year of the decade. Tom and I will run a different entry each day (we’ll also reblog the other’s post); and today we feature this excellent contribution from Mark at Fast Film Review – Cecil B. DeMille’s epic The Ten Commandments. This lavish, Technicolor extravaganza shot in VistaVision is Cecil B. DeMille’s last and most celebrated work. Remaking his own 1923 black and white silent movie, The Ten Commandments is a sumptuous religious epic. In 1956 Around the World in 80 Days was a luxurious bubble bath – a warm comforting experience. It was pleasant and enjoyable. As time wore on though that tub water deteriorated. The bubbles dissipated, the water got cold and the qualities that initially made it such a joy were no longer present. The production that apparently charmed audiences in 1956 has aged horribly. Today the Technicolor phenomenon now remains a long, bloated curiosity that stands as one of the most shocking peculiarities to have ever won Best Picture. The feature is a distended 175 minute bore based on the 1873 Jules Verne classic and that’s not even including the 10 minute intermission. Our story begins with a long introduction by Edward R. Murrow seated behind a desk discussing the” fantastic fiction” of Jules Verne, including the novel From the Earth to the Moon, which was the basis for the 1902 Georges Méliès silent A Trip to the Moon. Murrow lectures on the advances we‘ve made in space travel since then. After that disastrous opening, the main story opens on a scene in London, England, in 1872 about Phileas Fogg, a Victorian gentleman who bets his friends at the Reform Club that he can circumnavigate the world in 80 days on a £20,000 wager (roughly £1.6 million today) . Accompanied by his newly employed valet Passepartout he visits many locations as he interacts with various people along the way. The production was American theater producer Mike Todd’s crowning achievement. The theatrical impresario who had produced 17 Broadway shows during his career had never produced a theatrical feature. This was his first…..and last. He would tragically die in a plane crash a couple years later on March 22, 1958. He was married to Elizabeth Taylor at the time. It was her only marriage that didn’t end in divorce. The drama was filmed in a high resolution widescreen format called Todd-AO first used successfully in Fred Zimmerman’s Oklahoma! (1955). Mike Todd developed the 70mm print format with the American Optical Company in the mid-1950s. 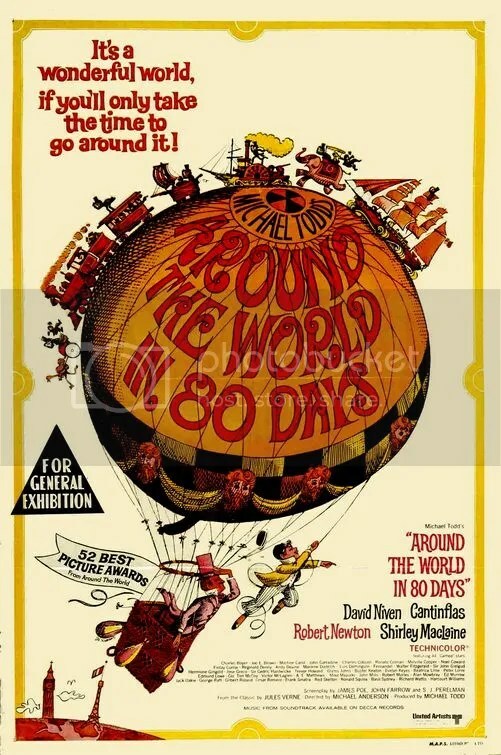 If nothing else, Around the World in 80 Days is a spectacle. The period piece was shot extensively in thirteen different countries, utilizing 70,000 extras and 8,000 animals. Areas from all around the world were represented including such distant spots as Paris (France), Chinchón (Spain), Bangkok (Thailand), Calcutta (India), Hong Kong (China), Yokohama (Japan), and the USA (Colorado). These locales provided the setting for various vignettes, none of which are particularly exciting. For example the flamenco dance and bullfights in Spain go on for far too long. Perhaps the promise of actual location shooting was enough to sustain a film at that time. Air travel was a luxury of the wealthy in the 1950s. Travel to far flung places wasn’t common. Regardless, these days any locale can easily be rendered via blue screen and computer, so the extravaganza doesn’t fascinate in the way it might have in 1956. Then there’s the stunt casting. David Niven’s distinctly British (read fastidious) portrayal of Phileas Fogg is a saving grace. Ditto the appearance of Mexican movie star Cantinflas. The latter makes his American screen debut as Fogg’s sidekick Passepartout. The screen legend gets a comic bullfighting sequence created just for him, not in the text. But Shirley MacLaine, in only her 3rd screen role, is forgettable. She is perplexingly cast as a princess from India heroically rescued from being sacrificed by our heroic duo. Robert Newton is a Scotland Yard detective who mistakenly thinks Fogg is a bank robber. His presence is charitably best described as an amusing annoyance. For star watchers there are nearly 50 cameos from then famous personalities, many of which are unknown today. I watch a lot of old movies and even I didn’t recognize a lot of these stars. However a few stood out including Peter Lorre, George Raft, Red Skelton, Marlene Dietrich, Buster Keaton and Frank Sinatra. This isn’t a quality film. It’s a sightseeing excursion with a chance to play “spot the star”. Call it an unfunny version of It’s a Mad, Mad, Mad, Mad World or a cinematic version of the It’s a Small World ride at Disneyland. There’s no other way to say it. Around the World in 80s Days is nothing more than a bland travelogue. What must’ve seemed like an grandiose marvel in 1956 doesn’t translate to the modern era. Our technologically advanced age makes this once epic period piece seem like an old dated relic. It still has value. Anthropologists should study this as a faded artifact of a bygone era. How this film won the Academy Award for Best Picture must certainly be one of the great anomalies in the Academy’s illustrious history. Now reflect on the fact that it beat The King and I, The Ten Commandments and Giant and the win seems even more egregious. But the accolades didn’t stop there. It snagged 5 Academy Awards out of its 8 nominations. The mind boggles. The only one it seems remotely worthy of consideration was for Best Cinematography and I would still argue it was up against stiffer competition. David Niven and Cantinflas make an entertaining duo. I liked them and the cinematography is pleasant. Oh and then there’s that animated end credits sequence titled “Who was seen in what scene…and who did what” created by Saul Bass. The whimsical cartoon is most delightful thing in the whole production. Lavish, Technicolor extravaganza shot in VistaVision is Cecil B. DeMille’s last and most celebrated work. Remaking his own 1923 black and white silent movie, The Ten Commandments is a sumptuous religious epic. Pure soap opera is woven into the Old Testament story about a man whose perspective changes when he realizes his true origins. Few films have attained such an unqualified level of sheer excess. Over the course of almost four hours, the picture dramatizes the life of Moses. That the script treats this topic with only the most holy reverence, is never a question. A viewing is akin to a religious experience. However it presents its subject with such unrestrained grandiloquence that at times, the exhibition verges on pageantry. Nevertheless the drama is an unqualified success. Two mesmerizing performances highlight the saga. Charlton Heston is front and center as the main character. He embodies every bit the part with honor and authority. Cecil B. DeMille had been responsible for his breakthrough as a circus manager in The Greatest Show on Earth. 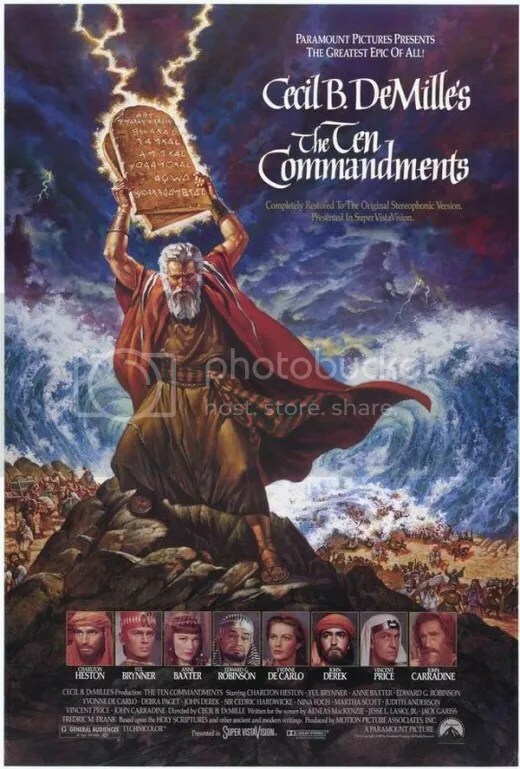 As successful as that picture was, The Ten Commandments would prove to be much more iconic. “Let my people go!” he demands in one of his signature lines. Matching Heston for sheer magnetism as his arch nemesis is Yul Brynner as the Pharaoh Rameses II. He will not relent seemingly ending every proclamation with “So let it be written, so let it be done.” For Yul Brynner, 1956 was a phenomenal year. The Ten Commandments was sandwiched right between The King and I which had come out 3 months prior and Anastasia which was 2 months away. His subsequent Oscar win for playing the King of Siam overshadowed his work here. It was well deserved but Yul is quite extraordinary as the unrelenting pharaoh. This is Heston’s film but Brynner’s importance cannot be underestimated. He is a charismatic villain yet he engenders some sympathy. One would not expect a ruler who advocates slavery to have any redeeming qualities. A scene where he pleads with a statue of a falcon-headed Egyptian god to resurrect his firstborn son has an unexpected emotional nuance. Cecil B. DeMille doesn’t know the meaning of moderation and thank goodness for that. Ornate sets, crowds of extras, special effects, it is a magnificent spectacle unlike any other. A director with a well tended ego, he even appears as himself at the beginning intro. Perhaps in an effort to silence critics of the liberties he took with the story, he freely admits that the narrative is compiled from sources that include other ancient texts. Occasionally the script veers into unintentionally hilarious dialogue. Perhaps chief among them, “Oh, Moses, Moses, you stubborn, splendid, adorable fool!” These actual words are uttered by Anne Baxter as Nefertiri, a part enhanced by her lustily exaggerated dramatics. She’s joined by a host of solid supporting performances. These include blacklisted actor Edward G. Robinson in a comeback role. He is memorably evil as Dathan, the unethical Israelite who betrays his own people. There’s sultry Yvonne DeCarlo as Moses’ loyal wife Sephora. This was before achieving TV fame as Lily Munster. Joshua, a young slave played by actor John Derek, later known for launching the career of wife Bo Derek, and Jewish slave girl Lilia, portrayed by 50s starlet Debra Paget. Even Vincent Price and John Carradine show up in minor roles. The Ten Commandments is certainly extravagant. It was the most expensive film ever made up to that point. All exterior shots were actually photographed on location in Egypt. It employs a cast of thousands with 70 speaking parts. In an era where they really had to hire all of those people you see in the background, this was truly an epic undertaking. No computer animation. This is all practical effects. In a surprising bit of restraint, only 3 of the 10 plagues are depicted: the water turning into blood, thunder & hail storm, and killing of the oldest sons. The latter features an Angel of Death imagined as a thick, green mist that creeps through the streets claiming the lives of Egypt’s firstborn sons. As memorable as that was, it pales next to one of the greatest special effects sequences of all time that follows the Exodus of over 12,000 extra. The production culminates in Moses’ parting of the Red Sea in the climatic scene. Even now it’s a visual feat to be admired. It was nominated for 7 Academy Awards winning 1 for Best Visual Effects. To this day, the movie is the sixth most successful ever when adjusting for inflation. It remains the yardstick by which all biblical stories must be measured..
P.S. I’m well aware Ben-Hur is technically set during biblical times but it’s NOT a biblical story. Simply put, a perfect adaptation of the Rodgers and Hammerstein Broadway musical about Anna and the King of Siam. 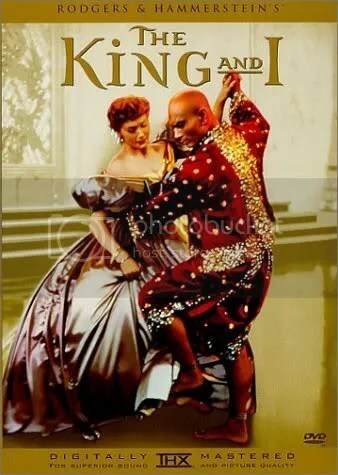 The sets are stunning, the costumes are superb, Deborah Kerr is glorious and Yul Brynner is iconic. What can you say about a film that presents the transcendent ballet, “Small House of Uncle Thomas” within the story, and actually tops itself. The entire film was shot in an extreme widescreen CinemaScope format. The actors practically leap off the screen in one memorable dance sequence. Bold, colorful, breathtaking and unforgettable. A cinematic achievement that deserves to take it’s place among the greatest musicals ever produced.